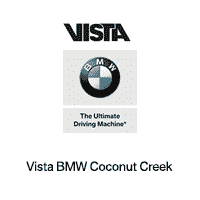 Searched the US for a specific CPO BMW, found it at Vista, worked a deal with Duane C., and made arrangements to pick it up and drive it back to Texas. Duane and the CPO manager were very helpful, accommodating and easy to work with, the entire transaction went smoothly with no surprises. I purchased a 2014 228i today from Vista, Duane Crawford was amazing to work with! I told him the price I needed and he made it happen no questions asked!! Easier car buying experience I’ve ever had!! Saleswoman very helpful . Provided various alternative vehicles to chose from and explained the differences of each vehicle and the pricing variances. Processed the paperwork and prepared the car quickly. I bought the car for my wife and we were in and out in 2 hours with her new vehicle. I've had my mini coming up on 3 years and will be turning in my current lease for a new mini. The sales consultants are extremely helpful and it is nice to not have to deal with people who are high pressure. They are very laid back which is why I refer to them as consultants because they help you understand your options without pressure. Although my lease is expiring this year I am getting another mini because I love driving it and the sales consultants and service advisors deliver excellent customer service. This was the first time I've built a car and I'm so excited about how it looks. My consultant Amanda is absolutely fabulous. She and her manager Ryan worked to get me the deal I wanted and had me in and out of the dealership in a very short time and provided top notch customer service! I highly recommend Vista Mini!!! JC at Vista really treated us well. We took a test drive and he came up with well priced demo. We came up with a fair price. The only downside was the length of time it took to get the paperwork together and meet with a finance person. I think that the finance Dept is understaffed for the volume of business that they do. Geri showed us all the features of the car and she was extremely helpful as well. Service was amazing Amanda and her mini team were very well spoken. They explain all there is to know about mini. They really did everything they could to get me the best deal. Now I love Mini hybrid is my favorite car. I will highly recommend this dealership! !